My husband introduced me to McManus shortly after we were married. I connected with McManus' sense of humor and abundant wit. *Ah hem* I also appreciated the fact the McManus, who was raised in Idaho, describes places that I've been to and have experienced to a degree. Having spent a short while living in the great state of Idaho, (And no, that is not a contradictory statement. Idaho IS great. ), I appreciate stirring pleasant memories by tales of outdoor ineptitude. 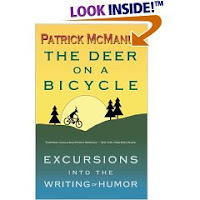 McManus spends the first half of this book explaining how to portray a situation or person in a humorous light. He writes about the desired effect (i.e., to produce laughter) and the amount of tweaking it could entail, also noting that he is not serious enough to spend a lot of time on re-writes. The second half of the book is used to share some of his own short stories and explanations of how they came to be. Even if you aren't inclined to take McManus seriously when it comes to writing instruction, it is worth reading this book just be amused. Or, because the front of the book quotes the New York Times Book Review as sayings: "Everybody should read Patrick McManus." Read it just because everybody should and/or every body does. He's funny. Reading his stories won't kill you although participating in any one of them might. Thanks Carrie. I'm adding this to my wishlist. I haven't read Patrick McManus, and I love a good humorous essay. Writing humor is an area that I would love to improve upon. I think I'm funny (don't we all think we are funny), but I do NOT write funny. Fascinating! I haven't heard of this author, I don't think. Thanks for the review. I have linked to it from my own review of this title.